The TUBE PREAMP II – MK2 is the revised version of our hybrid tube preamplifier which enjoys success all around the world. The revised version includes a number of features requested by customers. The original TUBE PREAMP II was equipped with two fully symmetrical outputs and one unsymmetrical output. We have integrated a further unsymmetrical output in the new TUBE PREAMP II – MK2 to take into account the wish for bi-amping configurations in the case of an unsymmetrical connection. In addition, the outputs are available with AC‑coupling and DC-coupling. In recent years our customers have continually made requests with regard to AC-coupling and DC-coupling and a number of customers wished to have their devices either completely AC-coupled or DC-coupled. Some customers also asked for both possibilities. As already mentioned above, the new device integrates both variations so that each customer now has the total freedom to make his own choice. The question of which variation sounds “better” mainly depends on the design of the connected power amplifier. There are some power amplifiers which are better connected via AC‑coupled preamplifier outputs and other power amplifiers which achieve their full sound spectrum via DC-coupled preamplifier outputs. The question is ultimately also one of personal taste. We do not intend to enter into such “philosophical” discussions, but would prefer to let the listening impressions of the customer make the decision. a. What does AC-coupling of the preamplifier outputs mean? The AC-coupling of a preamplifier output is made using a capacitor and a resistor. The selection and the size of the capacitor are important factors for a perfect result. The TUBE PREAMP II – MK2 is equipped with high quality, very rare 5% MKH capacitors, i.e. no wound film capacitors. This ensures the best possible low inductance. 1. Avoids operating point adjustments caused by undesired, but often unavoidable DC components in the signal. 2. Reduction of high frequencies which can be efficiently filtered out by the integrated capacitor. 3. Greater security (protection of DC components) in the case of defects, in particular with the connection to third party equipment or connection of tube power amplifiers. There is no general answer to this question. With an unbalanced device connection, i.e. via the outputs OUT 3 and OUT 4, the result with AC-coupling and the used types of capacitors is usually a more delicate, spatial, slightly softer and more musical acoustic pattern. The DC-coupling, on the other hand, sounds slightly more “direct”, “more overt” and perhaps slightly “more analytical”. For a symmetrical device connection there is no general answer, whereby the result depends largely on the connected power amplifier. Case 1: Power amplifier connection via balanced single output (= “usual case”, i.e. NO bi-amping). 2.) Balanced connection of the TUBE PREAMP II – MK2 to a third-party power amplifier: use OUT 1 (AC). Case 2: Power amplifier connection via unbalanced single output (= “usual case”, i.e. NO bi-amping). 2.) Unbalanced connection of the TUBE PREAMP II – MK2 to a third-party power amplifier: use OUT 3 (AC). Case 3: Connection of power amplifier via two outputs (bi-amping). 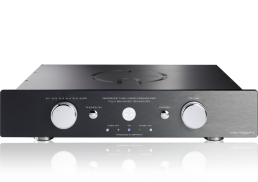 If two power amplifiers are connected to the TUBE PREAMP II – MK2 (bi-amping), the recommendation is to control the bass range of the connected loudspeakers via the DC‑coupled outputs OUT 2 and OUT 4 and to connect the mid and high range via the AC‑coupled outputs OUT 1 and OUT 3. High quality headphones are becoming more popular and as a result there have been a number of customer requests for an integrated headphone output. The headphone output is protected against dust under the chrome-plated brass cover cap labelled “PHONES” and is switched via the “PHONES ON” button on the left. We believe this switching ability to be absolutely necessary for the sound quality as the music signal is then only sent to the used connection. All possible interference factors are thus removed. A number of audiophile customers already possess a high quality headphone amplifier and wish to continue using it. To enable the best connection to the TUBE PREAMP II – MK2, we have integrated a switchable, uncontrolled output designed especially for this purpose. This output is also switched via the “PHONES ON” button. The analogue input SURROUND from ACCUSTIC ARTS® is a configuration possibility which allows the “loop through” of a signal of a surround processor through the TUBE PREAMP II – MK2 without further amplification. This means the volume of this signal is controlled by the external home cinema processor or amplifier and not from this preamplifier. This enables connection of a high-end audio system with a home cinema system without quality loss. Some customers and importers have requested this phase reversal. We have responded with the integration of such a switch. The ACCUSTIC ARTS® TUBE PREAMP II – MK2 is a preamplifier with an exceptional and uncompromising design along the lines of the so-called tube-hybrid concept. This concept, also an integral part of our TUBE-DAC II, combines the advantages of transistor technology with the advantages of the tube principle. Tubes are excellent voltage amplifiers, but can only supply a limited amount of current. As a result, in the TUBE PREAMP II – MK2 we place the tubes exactly there where these clear advantages can influence the acoustic pattern, i.e. for the voltage amplification. In places where current has to be supplied, e.g. for impedance conversion, we use the proven premium IC OPA627® from Burr Brown / Texas Instruments. This combination allows us to achieve very low-resistance outputs which are also characterised by a high current capability. We use solid state technology and tubes to take advantage of their physical characteristics to realise an exceptional, analogue sound experience with an extremely low harmonic distortion and excellent harmonic distortion spectrum which sets standards. As opposed to most tube preamplifiers, the TUBE PREAMP II – MK2 is in fact fully balanced, i.e. with 4 completely separate amplification stages from the signal input to the signal output. The 4 amplification stages are divided into one inverting and one non-inverting signal path per channel. Each of these amplification stages contains a high precision tube manufactured according to military specifications. This principle enables perfect channel separation. The loudness is adjusted via a high-end selective, high precision 4 channel potentiometer. It is natural that the TUBE PREAMP II – MK2 functions completely according to the proven Class A principle. An ideal power supply is a precondition for a high-end preamplifier. The requirements for the power supply with a tube-hybrid preamplifier are much higher than for a purely transistor-based device. This is because the tubes require different low voltages and also a high voltage of approx. 300 V for the anodes. This high voltage has to be precisely controlled and absolutely free of interference so that the music signal can be perfectly amplified in the tubes. For this reason the TUBE PREAMP II – MK2 is equipped with a number of separately functioning power supply units and 2 separate high-end transformers, with one transformer exclusively reserved for the voltage required for the tubes. Both the toroidal core transformers used in the TUBE PREAMP II – MK2 are of an exceptionally high quality and have the best possible core material from Switzerland in order to prevent any negative interference inside the unit. In order to ensure that the power supply units work perfectly, the filter capacity for all voltage circuits was selected generously (e.g. 20,000 µF alone for the voltage supply to the semiconductors). There is no dispute that the quality of the tubes is decisive for the quality of a unit based on tube technology. Tubes are sensitive components and thus have to be carefully selected and tested. We manually select the tubes and make pairs according to strict testing and measuring criteria to ensure that only perfect tubes are used in the TUBE PREAMP II – MK2. Before the tubes are fitted to a TUBE PREAMP II, they have already passed a two-stage inspection process: one inspection carried out by our supplier and a second inspection made by our own specialists. Before and after the first continuous test of 100 hours, all functions and parameters of the whole unit are inspected and recorded in a protocol. The values are compared and if the deviations are within a defined low tolerance range the unit is subjected to a further second continuous test of 100 hours. After this test further measurements are made and here the parameters must fit perfectly with the output values. In total, a TUBE PREAMP II – MK2 is measured and tested three times and the tubes are even tested four times. The TUBE PREAMP II – MK2 only leaves the premises of ACCUSTIC ARTS® after the requirements have been 100% met. This high level of scrutiny guarantees an extremely low failure rate of the tubes and ensures many years of uninterrupted musical pleasure. The type of tube used is a so-called dual triode tube type E83CC and belongs to the tube group 12AX7. The tubes meet the high requirements of the military and come from the current production of a European manufacturer. The sound can be described as: pleasantly warm with a very balanced sound pattern, a sophisticated bass range, clear high frequencies, good dynamics and low harmonic distortion. We prefer tubes from the current production and do not use NOS tubes, as these are not available in sufficient quantity and not available in consistent quality. The TUBE PREAMP II – MK2 guarantees absolute perfection through the exclusive use of selected components with low tolerances and highest quality grade. A number of the individual components are re-measured by hand and sorted into matching pairs. The housing is also uncompromising: solid, carefully crafted aluminium plates combined with chrome-plated rotary parts in brass allow for a high quality look and surface feel and excellent stability. Stability is important to ensure that the tubes can work undisturbed and are not compromised by any vibration present in the housing. As with all ACCUSTIC ARTS® products, the TUBE PREAMP II – MK2 is also easy to operate. This is a welcome change for many music lovers today when most electronic devices are overloaded with partly unnecessary functions. 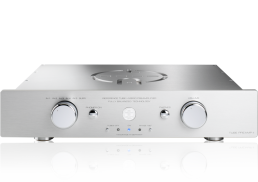 The basic functions of the TUBE PREAMP II – MK2 are operated by two chrome-plated rotary controls. Both controls are more or less built to last for ever. The rotary controls, for example, are solid and are equipped with gold-plated contacts, which are corrosion-resistant and also enable many thousands of switching cycles. The result of top quality individual components, detailed development work, innumerable sound tests, careful production and involved measurement tests is a sound experience of the highest perfection. In combination with the other reference series products of ACCUSTIC ARTS®, music is transformed into an incomparable sound experience “Handmade in Germany”. 12 kg / 26.4 lbs.